Thinking of becoming a Personal Trainer? Or perhaps you’re a seasoned PT, you know your stuff but find it hard to get/keep clients? Either way, if you want to grow your brand this post will help you understand the business and marketing aspects of being a PT and ultimately grow your personal trainer business. So, you’re qualified, eager and want to help people for the better. Great, but to do that you need clients. Follow these steps which are often overlooked by PT’s and you should be well on your way to creating a successful brand and personal trainer business (as well as earning a good living). This article is inspired by the launch of our new book The Business of Personal Training. Most PT’s go into this job because of their love for fitness and sport. Some trainers have an inspirational backstory, such as they have lost a lot of weight themselves or overcome a bad injury. However, EuropeActive state in their book Essentials for Personal Trainers that 50% of personal trainers throw in the towel after just 12 months. This post is dedicated to helping you run a successful personal trainer business. The trend for personal trainers is changing. As it is becoming more popular, there are more full-time jobs. Back in 2004, only around 55% worked full time, in 2011 this rose to 66%. Now in 2018 it’s estimated to be even higher. The average salary varies and is dependent on country and even city. It is also dependent on experience and whether or not you have your own facility. According to Payscale the average salary for a PT in the UK is £19,346 per year. This is below the national average of approximately £27,200 for full-time employees. However, the very best personal trainers earn much more than the average PT, so there is potential to earn a very good living. Some personal trainers can charge thousands just for one session. Although a growing industry, as personal training demand grows so does the competition. Here are some tips to set you apart from the average PT, they will help you grow your personal trainer business. What do industry statistics say about your market in relation to your product or service? What are the demographics of your location and what realistic projections can you make about tapping into that market? A good place to start is the Centre for Cities Data website which is a comprehensive online resource on this topic. It provides demographic information, such as population and education level. It also compares your city or town with other similar cities throughout Europe. You can find a template for the marketing analysis and demographics section in Appendix A of our new book The Business of Personal Training and in the web resource, where you can modify it for your purposes. Another thing worth checking is where people like to workout. Data from the European Commision (2014) found that the most popular place for Europeans to work out is actually at home, closely followed by in parks/outdoor areas. We put this question to our followers, as you can see outdoors won by a landslide. Food for thought for PT’s. According to the European Commissions, the favoured place to partake in physical activity is at home, closely followed by outdoors/parks. The stats look good for health clubs. 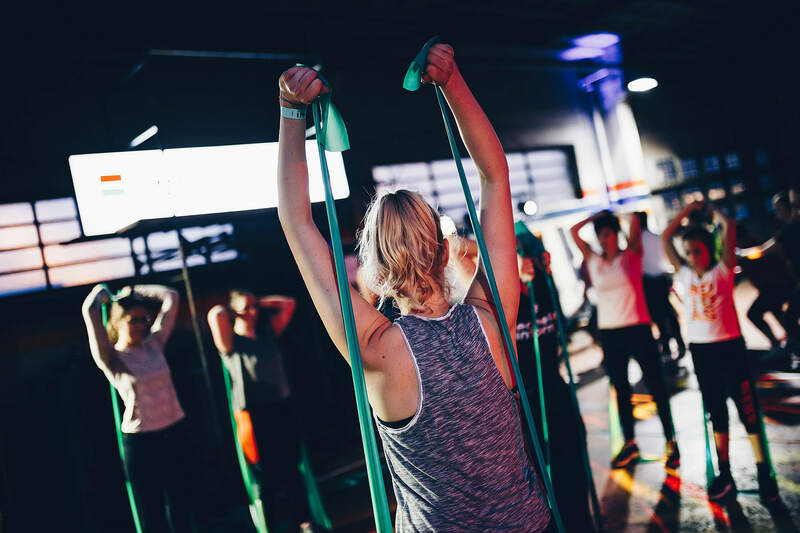 Recent research from EuropeActive states European health and fitness club memberships grew by 3.5% to 62.2 million in 2018, strengthening fitness as the #1 sports activity in Europe. Data from Eurostat (2017) found that 18% of people in the UK are a member of a fitness or health centre. The Swedes are most likely to join a gym (33%), in fact, most Scandinavians are very active and health conscious. The French are statistically one of least likely to join a gym (4%), however, they are much more likely to join a not-for-profit sports club. In western Europe the southern nations are the least active, in Portugal, 88% of people are not associated with any fitness centre, sports club or sociocultural club. In Greece its 83% and in Italy its 80%. In Sweden and Denmark, only 47% of people are not associated with a sport organisation/club. The UK is bang in the middle with 69% of residents not associated with a sports organisation/club. Outdoor gym in Sweden, the most active nation in Western Europe. More valuable statistics like this can be found in International Sport Management, 2nd Edition. This book was published in 2019. It covers the whole world, whether you want to PT in the Middle East, become an S&C coach in the USA, coach high-performance athletes in Australia or even brush up on your Muay Thai in Thailand this book is well worth a read. List all competitors in your area of operation, as well as their specific target markets. For example, if you’re thinking of setting up or working in a gym in a big city (such as London), there is a lot of footfall but there will also be a lot of competition. Will they be offering a similar service to yourself? Find your unique selling point (USP) and see if anyone else offers a similar service, see how successful they are. Next, address your strengths, weaknesses, opportunities and threats (SWOT) with regards to your competitors. This section is not a place to sugarcoat your offerings as compared with those of your competitors. If you require investors they will see through that approach and they expect you to face challenges. With that in mind, present an honest comparison that shows how your business’ strengths and opportunities outweigh its weaknesses and threats. If you find that this is not the case, then it’s time to reevaluate your business approach. What could you do to overcome your weaknesses and threats? It’s crucial to generate potential solutions before your business starts and fails. When you work for a club, they will typically do certain things to help you obtain and schedule clients. For instance, they will likely train you in using its client management system to handle tasks such as booking sessions, taking payments, redeeming client sessions and submitting payroll. There may well be other tasks such as cleaning and maintenance. Alternatively, some of these tasks may be handled by other staff members depending on the size of the gym. Some facilities offer free orientations/inductions or training sessions to new members and you may or may not get paid for this work. That’s okay. Every time someone is placed in front of you, it gives you an opportunity to get that person involved in personal training. In fact, when new members join—that is, at the point of sale (POS)—clubs commonly try to sell them either personal training or another specific programme because they are more likely to succeed (and to remain members) if they work with a fitness professional. However, the POS is also where most employers end their efforts to help you gain clients. If, for example, a class (such as spin or even Zumba) has had their instructor call in sick at the centre you work at, you should offer to step in and take the class, if you’re capable. This is a great opportunity to get in front of prospective clients. It is worth getting qualified in as many disciplines as possible, not only will this open up new audiences but it will help you grow your knowledge base as a PT, even if some of these classes aren’t what you particularly enjoy. But even some of the world’s best PT’s or even some of the best S&C coaches have had to try classes they don’t always agree with to get a broader knowledge base. This section outlines the key people and key positions in your organisation. Particularly important if you’re opening your own centre. Who is your facility manager? What is his or her experience? The manager is likely to be you. However, you still need to spell out your role and qualifications, both for your own clarity regarding responsibilities and to satisfy potential investors. What other positions exist (or will exist) in your company structure—for example, other managers or maintenance staff? Who else have you hired or will you hire and what do they bring to the table? You can find a template for the management plan in The Business of Personal Training where you can modify it for your purposes. Developing a financial plan helps you consider anticipated expenses as well as projected profits. You need to create an all-inclusive financial plan. It should address all start-up costs, such as renovation, equipment, office supplies, computers, insurance and licenses. It should also include ongoing expenses, such as payroll, rent, utilities, marketing and cleaning and maintenance supplies. Being a PT you’ll also need CPD points, which you can get from Human Kinetics at an awesome price, however, these still cost money so will need to be incorporated into your financial plan. Along with the anticipated expenses, you also need to include projected profits. Where will your revenue come from? What kind of growth do you expect? What does a profit and loss (P&L) analysis show? When do you project that your monthly revenues will surpass your monthly expenses? What is the outlook three years out? One tool that can help you organise your thoughts about revenues, expenses and programmes is a mind map. You can make a mind map as simply as writing on a napkin or by using any of various online applications; such as MindMeister. If you go through this exercise, you will be well on your way to getting a good grasp of your expenses. Provide as much detail as you can for each of the branches in the map. This content can then be transferred to the spreadsheets that you create for expenses and income. As you create this financial plan, ask yourself how many new members or clients you will pick up each month. How far away is that break-even point? The answer is different for every business and depends on your monthly overhead expenses. If you are opening your own centre, the initial outlay is a lot more than paying rent to a local gym, however, the long-term benefits may be more lucrative if you have your own facilities. In the book The Business of Personal Training there is a formula for break-even analysis that calculates the number of personal training sessions or memberships needed to make your revenue meet your expenses. In order to build your business, you need to reach your target market; therefore, your marketing plan is critical to your success. To develop your plan, consider your target market carefully, then decide purposefully where to spend your time, effort and money in order to connect with that market. In the Foundations of Professional Personal Training, 2nd Edition it discusses in depth the 4 P’s (product, price, promotion and place). The book states that these areas form the core of your marketing plan. The marketing plan is the comprehensive action plan that will generate clients for your business. Let’s take look at the 4 P’s of marketing and how you can apply them to your personal trainer business. In 2019 we wrote an article on Gym Marketing, we’d encourage you to read this too, especially if you’re wanting to grow your business digitally. For our purposes, the product is actually you and your services. To be successful, you need to have a firm understanding of your product and how to set yourself apart from your competition. This is your ability to separate yourself from other personal trainers and make yourself unique. An example of this is a trainer who has some special educational experiences (e.g., university degree, worked with professional athletes or had specialised training). Find your niche, you could do this by finding a unique workout and become the expert. Perhaps you could master Olympic lifts or fat burning exercises or become known as the ‘strength expert’ in your gym/village/city. Get a focused and targeted client base (e.g., seniors, people looking to lose weight, people with no time), find out what they want and deliver. Develop special personal characteristics (e.g., being a great motivator). People often get a PT because they want someone to talk to in the gym to put them at ease. The more you can differentiate yourself, the more likely you are to be remembered. Become a member of a professional body such as Chartered Institute for the Management of Sport and Physical Activity (CIMSPA), Register of Exercise Professionals (REPs) or British Association of Sport and Exercise Sciences (BASES). Ask your clients what they’re looking for. Join industry groups and associations to keep up on trends and to network. Look at other industries to see what’s working for them and then determine whether you can use similar ideas in your business. The fitness industry is constantly changing and we are continually finding new and better ways for people to improve their health and achieve their fitness goals. Generating new ideas for you and your clients is critical to your long-term success in the industry. Most successful trainers agree that one of the keys to their success is their ability to continually re-educate themselves and then incorporate this new information into how they work with their clients. Positioning is the perception that people have of you and your business. This perception can be based on what they see and how you present yourself, or how others speak of you. Each of these factors leaves an image in a potential customer’s mind. It is critical that you spend time thinking about the image you want people to have of you. Ask yourself what image you want to set and what message you want to communicate. It is crucial to ensure that you are consistent in your approach to positioning. Think of them as brand guidelines for yourself. People need to know what to expect and are looking for consistency. Remember different customers are looking for different things, whether it be motivation, knowledge, encouragement or to just be worked hard in the gym. Some PT’s make a very good career from a no-nonsense approach, others benefit from a much softer approach. As mentioned above, it is essential that you have a financial plan. There are many ways to price your services. Pricing for personal training will vary based on many factors, including geographic location, your experience and education and the number of other personal trainers available (competition). You will already have some knowledge of the local economy and the supply and demand having looked at the Centre for Cities Data website. Generally speaking, you will be able to charge more for personal training in certain areas based on the cost of living and the economy in those areas. Trainers with more experience and education are also able to charge more for their services; the only stipulation is that you need to show people what they will get with this added experience and education. A highly competitive market for personal training will normally force trainers to charge similar prices since clients often shop around for the best value. In these situations, it is critical that you’re able to sell yourself and differentiate yourself from other trainers. These are competitive prices for an hour session in most cities in the UK. It is also worth considering a rate for a 30-minute session for those who are time poor. Perhaps charge around £25 a session. Some PT’s also offer boot-camps or grouped sessions to lower the cost for their clients. Some PT’s will argue that this is not ‘personal training’ as everyone has different goals and motivation. Also, what one person reacts to might not work for everyone, however, it can be used to lure people in and are often fun and competitive. CanFitPro sate in their book Foundations of Professional Personal Training 2nd Edition that group training works best when the trainer has created a 4- to 10-week programme based on a challenge or goal and all the clients have similar fitness goals. It is also good for those who might be shy and don’t want to work out alone, so train with their friends or partner. Instagram is particularly popular in the fitness industry. Many digital marketing experts believe video is the future and there are numerous statistics to back this up. People love videos! This is your opportunity to create motivational videos and specialised coaching videos. If aesthetics is your client’s goal it is also recommended to do before and after shots of your clients. If your client approves get many pictures of you and your clients’ training maybe even pictures of the books you own, it shows you are always learning. Human Kinetics has a great selection of personal training books that can help you in your career. This will help you keep your clients and gain new customers. Remember to use some relevant hashtags too. Facebook is another way for you to promote your business to new clients. With Facebook adverts, you can target people with a specific interest. You can also target by location. Twitter is another excellent tool to promote your business. Give out tips and encourage engagement, also retweet other fitness tips or scientific research – feel free to follow us for all the latest on fitness @HumanKineticsEU. Just remember to keep on top of your social media and be creative. Create business partnerships – Involve other businesses and co-promote. Aim to work with physiotherapists, nutrition or health food shops, chiropractors, local sports clubs, weight loss clinics and any other local businesses. You can share clients. Mail out printed items for direct marketing or if you work at a local gym ask to get them to post something out, reduce your costs. E-Marketing – E-mail is a great way to market your services if you are able to obtain reliable e-mail lists of potential customers. It’s quick, cheap and effective. However, it is imperative that you obtain permission to send these people e-mails to ensure you don’t put yourself or your business at risk of breaking the law. Get business cards, take them everywhere with you. Opportunities can arise in a variety of places. Get your logo, name, number, website and social media handles visible. Do some media outreach. Send out a press release. Try to get on local television or radio you may need to buy an ad but it could be worthwhile. Contact local well-known people, see if they want a free session or a programme plan, get them to help you promote yourself to the local media. Retired athletes are a good shout for this. Take out a newspaper ad timed to announce key events or new programmes. Run a recommend a friend scheme. Sponsor or host a community activity or event. Jump on the back of an event. For example, you could run a parkrun branded up in your PT gear. Or even run a Bootcamp in the same park, not to encourage ambush marketing but as long as you are staying out of the way of the track it shouldn’t be a problem. You could even hand out flyers to runners post-event. Just check with the event director beforehand. Establish yourself as an expert. Run seminars at your local centre providing training and nutrition tips. Do internal competitions, this is a fun way to bring all your clients together, get a medal for the winners and a branded t-shirt for everyone who enters. You could also do daily/weekly challenges. Create a website. You could make the website transactional where clients can pay and book sessions with you online. If you’re training a client, you don’t want to be answering your phone all the time looking for new business, it will discourage your current client. You need to make them feel special in the time you have with them. You also do not want to miss out on potential new bookings so making a transactional website will be beneficial. Another benefit of having a website where you can take payment is that you don’t have to handle all the money in the gym. A website is also one of the best places for you to obtain and collect electronic leads, which also ensures permission has been obtained for sending e-mail. It is also the go-to place for people who are looking for prices, timetables and information about yourself. Gather testimonials from your clients, these can be used in your promotional efforts. If you have your own facilities, make some merchandise such as training t-shirts, hoodies and hats. This makes people feel part of a team and it is free advertisement for your club. You don’t have to make much, if any profit, on these, the brand awareness will add value on its own. Practice what you preach. You are your own walking, lifting and jumping advert. You want people to look at you and be inspired and motivated to look like you! Seek both science and application. Talking about science, read! Education is key. Your clients want to know that you’re passionate and well educated, prove you know your trade better than the competition. Some clients love the science, they may even want you to share articles and recommend books for them. However some clients might be overwhelmed by too much science, so just remember to know your audience. Be real, be honest. The best way to promote yourself is by being yourself. You are a qualified PT so you know what you need to know. However, sometimes you might be asked questions that you don’t know the answer to. If there’s something you don’t know, admit it, but say you will do some research. Then make sure you look into it and give them a solid answer in your next session. Also, remember to be human and take an interest in your clients, maybe your clients son had a big football game last weekend, maybe their daughter had a gymnastics competition, maybe the last time you spoke he/she was hoping to book a holiday or buy a new sofa. Whatever they spoke about remember and ask them how they got on. Take notes about what they lifted or ran etc but also take notes about their personal life. They’ll appreciate it. Perhaps the most important of all is networking – Just speak to people, get your message across let them know face to face what you are about and what you can do for them. Build trust and change their lives for the better, forever. When doing promotion to gain new clients, don’t forget about your existing clients. They’re the most important thing to you right now. Although marketing can be time-consuming, you must not let your training programmes slip. Retention is key to growth. Map out when your marketing campaigns will happen and how much you will spend on them. Some of your promotions could be timed to address holidays, key local events or partnerships with nonprofit fundraisers. All good marketers track the results of their promotion efforts. How else will you know if the time and money you’ve invested have been well spent? When people call you or come in to see you, you should always ask how they heard about your business. Digitally this is easy, get to grips with Google Analytics and social media platforms analytics. Each month you should have a running total of where your new clients are coming from. If all of your clients are coming from referrals, is it really necessary to spend a lot of money on direct mail or newspaper ads? The fitness industry is not unlike many other retail industries in that the location of your business will play a major role in your initial success or failure. People won’t normally drive more than 12 minutes to join a fitness club. Other factors to keep in mind when choosing a location are traffic flow, transport links, parking, signage, the perception of the neighbourhood and future potential for expansion. Whether you are looking at opening your own personal training studio or working in a fitness club, your choice of location is an important one. If you are working in a budget gym (membership is under £15 a month) the likeliness of gaining a client is reduced to that at a premium gym (even if the foot-fall is higher) as their customers probably have more disposable income or take their training more seriously. Successful trainers agree that once you have a dedicated client base, your location is not as important. If your clients have been with you for a long time, they are more likely to drive a little further to stay with you. This might sound contradictory to the earlier statement about people not being willing to drive more than 12 minutes. This is true of new clients, but if you have a loyal group of clients, the regular rules don’t always apply when it comes to location. However, this is not to say that people will be willing to drive an extra hour to an area of the city with no parking and a high crime rate. When most people start up their personal trainer business they are usually comfortable talking about fitness, however many PT’s are uncomfortable with selling their business. Images of pushy, insincere salespeople come to mind. The good news is that if you are to run a successful as a personal trainer business, the high-pressure sales approach is not something you need to worry about. This approach might work in the short term, but it will eventually turn people off and hurt your business. Marketing will bring people to you, but you need to be comfortable selling your services if you want to make a living in this industry. The key to being comfortable with sales is getting people to trust you. If you know and believe in your product and can show prospective clients how it will benefit them, then you have the potential to be good at sales. Luckily, exercise is something that everyone needs, so you don’t have to worry about trying to sell people something that they won’t benefit from. When approaching a potential client, introduce yourself as a PT, be polite, listen to the customer and gain an understanding of what they want from their workout. Then show them how you can help them achieve their goals. Greg started out as a PT before opening his own gym, Extreme Conditioning in Huddersfield, England. His no-nonsense, results-driven approach has built a competitive yet friendly environment. His retention figures are exceptional and he has developed a bunch of athletes who encourage each other in every session. He is now one of the leading names in strength and conditioning (S&C). As well as running a successful personal trainer business and his own gym he is also the head of S&C at the Rugby League club Salford Red Devils. He has helped turn them around from struggling a Super League side to one of the strongest and fittest teams in the league in just a couple of seasons. Building a Personal Trainer business takes time. Gain as much experience as you can, even if that means working for free at first. To become a good PT you need to gain exposure and build confidence. Greg states that you may have to combine careers for a while, maybe get a part-time job when you are starting out so you have a basic income. He believes so many PT’s fail early by putting all their eggs into one basket too soon. Even if you can’t get clients initially, keep training and practice your PT skills with friends and family. Weekly workouts to keep customers engaged and encourage healthy competition. Greg says the reason Extreme Conditioning has done so well is due to the team environment that has been encouraged. Although singular PT sessions are great to focus on key areas he recommends group classes, these make clients feel more comfortable and reduce any anxiety or nervousness. As a PT it also helps expose you to numbers/groups and different characters. It’s also more time efficient and better for you and your clients from a financial point of view. In the short term group classes are better for retention too as clients are training with their friends. Think big, take small steps! Before you open your own gym you should ask yourself what do you know about business? What do you know about progressing people? You must learn these and understand all processes or you will fail. Images below are taken from @extremeconditioning Instagram. Kirthi is a great example of a determined individual who has worked their way up from being a “skinny newly qualified personal trainer” (his words) to a successful gym owner. He now owns Body Transformation Gym, a 24-hour gym in West Yorkshire. Kirthi began his fitness career in a council gym, without any experience. He started out working full time as a fitness instructor doing whatever management told him to. Then he got a few PT clients and worked as a part-time PT and part-time fitness instructor. Whilst doing this he saved the majority of his PT money and began to research locations, running costs and start-up costs of a personal training studio. He made a plan and followed it through, giving his notice to the council gym. He spent £2,000 on gym equipment and put £2,000 in a pension and kept £1,000 as a buffer. It was a 1,000 sq ft facility which cost about £150 to renovate. From then, he was personal training in his own spot and he said the feeling was incredible! Shortly after he found a 4,000 sq ft facility, developed a business plan, got a £6,500 loan from the bank (plus a little help from his family) and he’s never looked back. Create a free ‘gocardless’ account and put people on a monthly or weekly Direct Debit. Gyms shouldn’t be chasing members every month and neither should PTs, you’re a PT, not a debt collector! Automate payments and then you can focus on the sessions! Get good. Half joking he states, too many PTs have an inflated opinion of themselves just because they have a good/great physique. If you don’t know how to give clients suitable tailor-made nutrition and exercise plans, then do your research from reputable sources and ignore any “broscience”. Guarantee results. See above. If you know your stuff, then guarantee it, if clients agree to SMART (Specific, Measurable, Assignable, Realistic, Time-related) performance goals. This adds value, reduces objections to buying and distinguishes you from other PTs. Low-quality clients as a general rule. If it’s cheap, people wonder why it’s cheap. Are you cheap because you need more clients? Are you cheap because you need the money? Why do you need more clients and more money? Is it because you’re a bad PT and people don’t want to train with you? All this will go through a prospect’s head. Don’t be cheap, add value and guarantee results. More hours needed to work to earn a living. Being with a PT can be challenging, it can be really long hours and hard on a relationship, if you’re cheaper then you will need to work even longer. Hopefully, this post has given you plenty of ideas. If you have any more ideas please comment below. Now go out there and run the best Personal Trainer business you can! If you’d like more information, why not watch for our free webinar with Future Fit titled How to make money from Personal Training. All courses – Our courses are approved by 52 accredited organisations. We have many courses approves by REPs and BASES too. Great article, Ryan! This makes such a great read for both those wanting to start thier PT career but not sure how to go about it as well as those who have just recently qualified as personal trainers and are looking for advice. Previous PostStatic stretching vs. dynamic stretching: Which is the best?